The miniSpinner Maintenance Kit includes spares, lubricant, and a tool for cleaning and maintaining your miniSpinner. 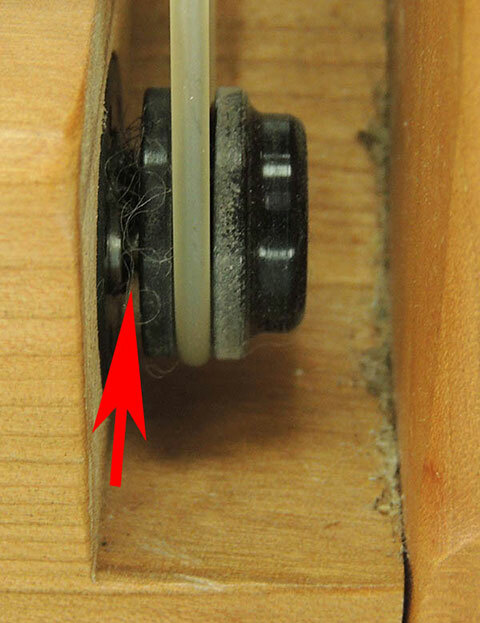 Use the pick from the Maintenance Kit to remove fuzz if it accumulates on the motor shaft, see the arrow below. Everything you need for e-spinner maintenance in one convenient tube! Everything you need to maintain your MiniSpinner kept in a neat sturdy tube. When you need this - you'll NEED this! I recommend a maintenance kit for EVERY MS buyer. First, because whenever you change flyers, you need to "apply a thin film of grease around the outside of the orifice tube" each time you change the flyer (read your manual!). If you don't do that, eventually, your flyer will decide not to spin (ask me how I know.) So if you're not using your grease, apparently you're only using the one flyer - and even then, it wouldn't hurt to give it a little lubrication once in a while. Secondly, when your brake band either breaks or the spring gets pulled out of whack, you're going to NEED a spare if you want to keep spinning - again, ask me how I know! Thirdly, you REALLY need to use the pick to make sure you're keeping fibers out of the motor sheaf down near the bottom of the drive band. Letting fiber build up there is REALLY bad for your motor - and if you regularly use fluffy fiber, it WILL build up there. I don't know of any way to get it out without a nice sharp instrument like the dental pick provided in the maintenance kit. I use my maintenance kit regularly - for, well, maintaining my mini spinner! It's a well-thought-out set of tools that every MS owner needs and is priced less than you can buy them on your own. Highly recommended. All the tools in the kit are in great condition and thoughtfully packaged.